Greetings again from the darkness. A math professor and an art professor are apt to view the world discordantly, but it doesn’t mean they aren’t capable of a strong personal relationship together. After planting a morning kiss on the cheek of his wife, Paul sets off on a one-man survival hike through the hills and forest. When he doesn’t return, the mystery begins. Only it’s not really a mystery, and it’s certainly not the thriller it seems to be disguised as. Rather, it’s a character study of how a rational mind works to make sense of a world that can’t always be explained logically. Lisa Robinson and Annie J Howell have co-written and co-directed this story that gives Betsy Brandt a chance to really spread her dramatic acting wings after her time on “Breaking Bad”. Here she plays Claire, a math professor, wife, and mother to Connor (Zev Haworth). 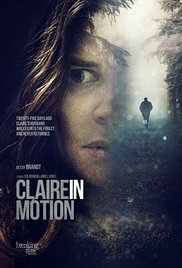 Being of sound mind and structured thought, Claire immediately starts trying to find the logical reason for the disappearance of her husband. What she discovers is her husband often secretly veered from the structured life she so valued. This leads Claire to an awkward meeting with Allison (Anna Margaret Hollyman), one of his grad students. It turns out Allison and Paul had a pretty close connection over an upcoming art project. By now, you are probably sure you have this movie figured out. Fortunately, the filmmakers ensure it’s not as predictable as you might think. It’s not a thriller like Gone Girl or Deceived. We watch Claire re-trace Paul’s steps on a path unfamiliar to her, and this evolves into a self-realization that she had been sleep-walking through life: doing her job, raising her kid, going home each day. There’s a key moment when she’s watching an old video of herself and Paul, and he says “look at me”. It’s at this point she begins to understand – and it’s enhanced by a chance meeting in a bar with a former student. Maybe Paul isn’t the only missing person. Son Connor probably doesn’t get the screen time his character deserves. Like his father, Connor has some secrets of his own. His friends don’t know he enjoys knitting, and he intends to keep it that way. It’s one more indicator that no matter how close we are to someone, we don’t know or share all. Finding and discovering one’s self can be a torturous process before it ever reaches enlightenment, and though the story short-changes the process of grief, we do understand not to mindlessly nod when someone says “you know me”. This entry was posted on Thursday, January 12th, 2017 at 8:40 pm and is filed under Drama. You can follow any responses to this entry through the RSS 2.0 feed. You can leave a response, or trackback from your own site.